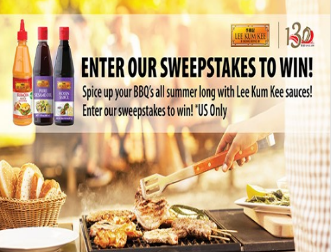 Lee Kum Kee Summer Sweepstakes – Win a $130 Visa gift card! Win a $130 Visa gift card (6 winners)! ENTER SWEEPSTAKES HERE – Lee Kum Kee Facebook page. ELIGIBILITY – This contest is open only to legal U.S. residents, over the age of 18.